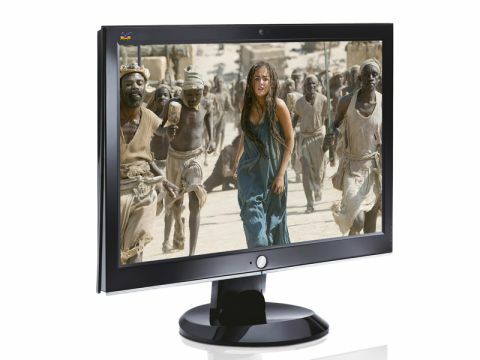 The Viewsonic VX2255wmb is a 22-inch display with a 1680 x 1050-pixel resolution and a choice of VGA and DVI-D inputs. The 1.3-Megapixel webcam in the top bezel is similar to those found in some of its rivals, but after some hunting around we found a feature that makes the Viewsonic stand out. In addition to a tilt and swivel adjustment, the VX2255wmb also has height adjustment. It's not earth-shattering, but it's the best we can do. Cosmetically, the Viewsonic has striking looks thanks to a piano-black finish that is set off with an aluminium power button located in the centre of the lower bezel. The four control buttons for the OSD are located on the right-hand side above the headphone mini jack. You operate the buttons by touch which is simple enough, once you get used to the Viewsonic way of doing things, but black buttons on a black background don't make life easy for the customer in the first place. When you use a digital connection you'll find that the settings buttons are mostly irrelevant, but those users who have a laptop with an analogue connection will be grateful for the auto-adjust. It's mildly annoying that Viewsonic has gone to the trouble of adding a USB webcam, but hasn't provided a USB hub. The specification of this display didn't offer us much hope of a great image, as the brightness and contrast ratio figures are rather low and suggest the TFT panel is going to be rather average, and that is exactly what we found. Although colours look pleasant, the picture has no zip or zing to make you feel that the image is alive. Instead it looks somewhat pale and washed out, whether you use an analogue or digital connection. Viewsonic delivers good value at this price point, but the VX2255wmb is unlikely to set your heart racing.